This is comfort food at it’s finest. It’s where it’s at and what it’s all about. 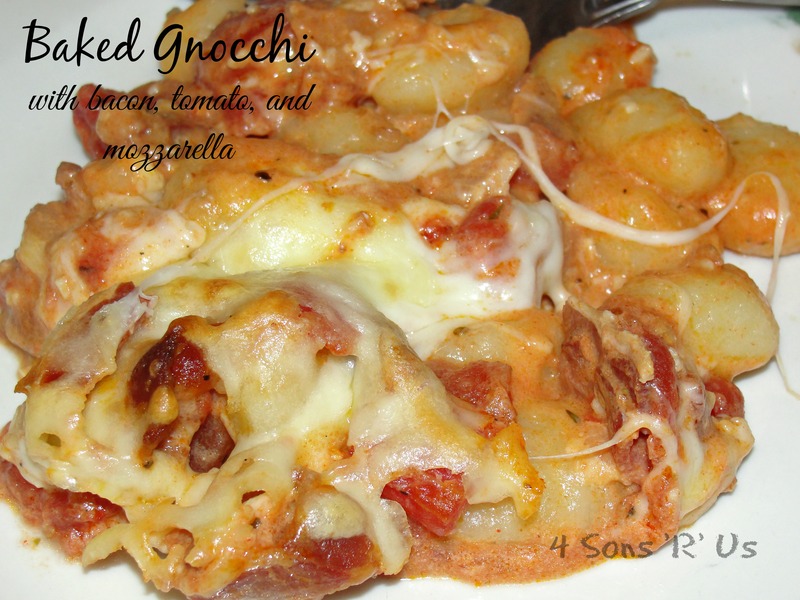 Little pillows of happiness (gnocchi) are smothered in a delicious tomato based ‘sauce’ with bacon and topped with mozzarella cheese that’s baked to golden-brown perfection. And, let’s be honest, what doesn’t taste better with bacon? Mmm, bacon. Comfort food for those who need comforting. Even if you’re not in need of copious amounts of comforting, it’s ok to splurge once in a while. Caloricaly speaking, of course. 2. Bring a large pot of salted water to the boil, and in the meantime, make the sauce. 3. In a large, hot frying pan, fry the bacon until starting to crisp with most of the fat rendered. 4. Pour off most of the fat then add the garlic and smoked paprika and fry for 30 seconds. 5. Add all of the tomatoes and the sugar and allow to simmer for 5 minutes. 6. Remove the pan from the heat and stir in the cream, parsley and seasoning. 7. Cook the gnocchi in the salted water until it starts floating to the top. Remove with a slotted spoon and add to the sauce. 8. Transfer the gnocchi and sauce to an oven-proof dish and top with the sliced mozzarella. 9. Place in the oven and bake for 10 minutes until the mozzarella is melted and golden. 10. Remove from the oven and allow to rest for 5 minutes before serving. Look’s like cheesy goodness, Meaghan! Love the incorporation of bacon. Thanks Haley! It’s a cheese-lovers paradise. Let me know what you think if you give it a try.